This has several meanings in Canadian conversational English, or everyday English. In very informal, casual conversations, you might hear it this way. 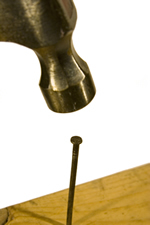 To nail something means to do it precisely right. 1. I was really worried about that exam, but it was easier than I expected. I think I nailed it.